Since 2008 CSz Sacramento has been changing the world through collaboration, inspiration, gratitude, and fun. With over 1,000 showings, our flagship show ComedySportz has been performed more than any other show in Sacramento. Each week the Blue Team battles it out with the Red Team in an improv improv comedy competition. Fan suggestions power the content and the ever-present referee ensures the comedy is suitable for everyone. From our all ages ComedySportz matches to our Late Shows line-up, we've got a funny show for you at our Sacramento theater and comedy club. Since 2008 we have entertained and trained hundreds of the Sacramento region's top organizations, including over 10 Fortune 500 companies. In addition, we've been featured at schools, conferences, associations, private parties, and faith-based organizations. Our diverse array of improv comedy shows and workshops, customized to your organization, are completely scaleable from 10 to 10,000. CSz Education has trained tens of thousands of students worldwide and been named one of the 8 best improv comedy training programs in the country. 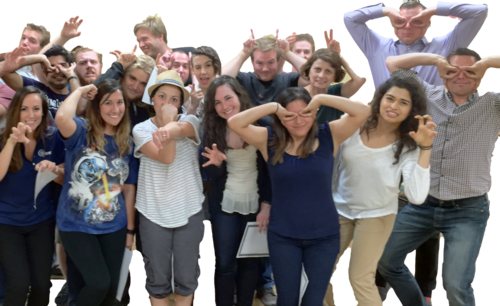 Our classes are a fun, supportive way to learn improvisational thinking, gain self-confidence, develop business soft-skills and meet people. A complete training series is available for adults, and we also offer a special High School League.